← The Russians are coming? Above is the first paragraph of the FBI Interview Notes. It lists Hillary Clinton’s attorneys present for this interview. One name is redacted and one can only wonder why? Accompanying Mrs. Clinton into the meeting were her lawyer David E. Kendall; Cheryl D. Mills and Heather Samuelson, longtime aides who are also lawyers; and two lawyers from Mr. Kendall’s firm, Williams & Connolly, Katherine Turner and Amy Saharia. So, was the other attorney Amy Saharia, as the New York Times reported back in July, or was it someone else? Why on earth redact the name, if it was Saharia??? There are several redactions on who was present from the DOJ. The FBI Notes list two people from the DOJ/FBI side and have three names redacted, which comes to 5 names, although the NY Times story says there were 8 DOJ/FBI people present, so who are 3 redacted names + 3 others mentioned in the NY Times story??? Even if that one long block of redaction, after David Laufman’s name is more than one name, we are still left with knowing only 2 names of who was present from the FBI/DOJ and leaves SIX unknowns. Something is very wrong when you compare the NY Times report to the FBI Notes. “Readers may recall that I suggested back in May that “the fix” was in in the investigation of the Clinton emails. The reason was that the Justice Department was allowing Cheryl Mills – a witness, if not a subject, of the investigation – to invoke attorney-client privilege on behalf of Mrs. Clinton in order to thwart the FBI’s attempt to inquire into the procedure used to produce Clinton’s emails to the State Department. Mills was a participant in that procedure – and it is the procedure in which, we now know, well over 30,000 emails were attempted to be destroyed, including several thousand that contained government-related business. When she worked for Clinton at State, Mills was not acting in the capacity of a lawyer – not for then-Secretary Clinton and not for the State Department. Moreover, as Clinton’s chief-of-staff, Mills was intimately involved in issues related to Clinton’s private email set up, the discussions about getting her a secure BlackBerry similar to President Obama’s, and questions that were raised (including in FOIA requests) about Clinton’s communications. There is no way Mills should have been permitted to participate as a lawyer in the process of producing Clinton’s emails to the State Department nearly two years after they’d both left. I thought it was astonishing that the Justice Department indulged her attorney-client privilege claim, which frustrated the FBI’s ability to question her on a key aspect of the investigation. But it is simply unbelievable to find her turning up at Mrs. Clinton’s interview – participating in the capacity of a lawyer under circumstances where Clinton was being investigated over matters in which Mills participated as a non-lawyer government official. According to the FBI’s report, Mrs. Clinton had four other attorneys (one whose name is deleted from the report for some reason) representing her at the interview. She clearly did not need another lawyer. And it is Criminal Investigations 101 that law enforcement never interviews witnesses together – the point is to learn the truth, not provide witnesses/suspects with an opportunity to keep their story straight, which undermines the search for truth. 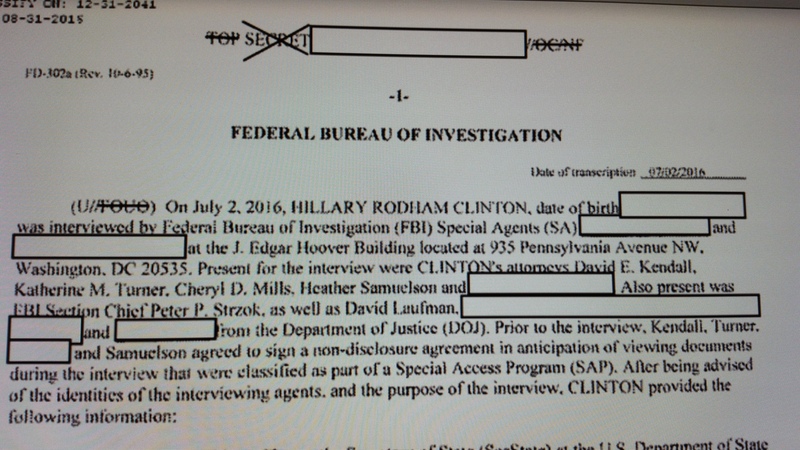 Why on earth was Cheryl Mills permitted to sit in on Hillary Clinton’s FBI interview? Something smells very wrong here. I wonder if perhaps Bill Clinton and Loretta Lynch were present to oversee this interview and assure it led nowhere? Would that even be possible? We deserve an answer as to who all was present for this kangaroo proceeding!!! And lest we forget, James Comey folded his cards on an indictment on July 5, 2016, as President Obama was en route to a campaign stop in Charlotte, NC, with Hillary on board Air Force One with him. Perhaps the FBI Notes release is a SOS from the FBI to let the American people know the rule of law has been hijacked by the Clintons and Obama. You provide an invaluable service going through all this for the rest of us. How you do it I don’t know. Thanks:-) I’ve been watching the Clintons for decades:-) And btw, my Messages of mhere story tabbed at the top of my home page is the truth – it happened. The retired general mentioned was forced to retire, he hates my guts over some personal letters of mine that ended up at the Department of the Army after Desert Storm (I did not send them there btw). After this impeachment mess he became a FOB – got recommended by Bill Clinton for an overseas position that the circumstances of his retirement should have precluded him from even being considered. He is still a loyal FOB, whom they roll out as a “military expert” for the Dems. In 1998, I was writing comments on their “SPIN” and lies on the Excite message boards and then some of my comments were “borrowed” by real Republican pundits. I was attacked in my home. A great deal of effort was made to silence me. My husband was still on active duty and he was manipulated and urged to have me involuntarily committed. I spent 18 days locked up and was lied to and efforts were even made to trick me into signing paperwork to agree to being committed to a state mental hospital permanently. A hearing was arranged without anyone informing me there was going to be a hearing. I could dress, talk and function without any help and many of the other patients’ visitors mistook me for part of the staff, because other patients talked to me about all their problems. I refused treatment though. During a visit, one of my sons, a young teen at the time, told me that the psychiatrist had called my husband late the night before and tried to convince my husband to agree to having me committed to a state mental hospital. My son told me my husband was sitting there crying. After that visit, I demanded an attorney and it is only by luck I haven’t spent the past 17 years locked away in a state mental hospital. My rights were violated when I hadn’t been informed about the hearing or any of my rights – so the judge dismissed that and I was released. That woman will do anything to become President. She was the one doing damage control during impeachment. They violated the chain of command by feeding false information to that retired general and I believe some other soldiers were “recruited” to assist in that. So, beyond the posse comitatus issue – they used military assets to attack a private American citizen (an Army wife at that) over comments on a freakin’ message board. I don’t even have a speeding ticket on my record, I have never owned a firearm in my life and I am just a homemaker. Your husband is willing to vote for trump such as he is. Why not you, just so you can help to make sure Hillary is never in the White House? I am still hoping her past will be fully exposed before November. And I believe the Clinton corruption ran right through that Potemkin Trump campaign last year, so I hope he is exposed too.